Recent studies show that in the next few years many companies could have only about half the leaders and skilled workers they need--and that these talent shortages will be particularly acute in the critical sectors like engineering, health care, energy, government, manufacturing, and aerospace and defense. As a line executive you need to ask yourself one question: Do we have who it takes to drive business performance in the future? 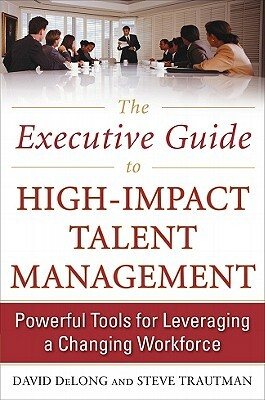 "This book is full of practical insights that will make you a more effective leader today." -- Hy Pomerance, Chief Talent Officer, New York Life Insurance Company. David DeLong, author of the widely praised Lost Knowledge: Confronting the Threat of an Aging Workforce, is an internationally known researcher, consultant, and acclaimed keynote speaker. His firm, David DeLong & Associates, based in Concord, Massachusetts, helps organizations maximize future workforce and leadership capabilities while grappling with changing workforce demographics. He is a Fellow at the MIT AgeLab and has been an adjunct professor at Babson College, teaching the MBA course -Leading & Managing Change.- For more than two decades, Steve Trautman has advised executives on practical ways to hire, train, motivate, and measure employees to ensure high-impact performance--and profitable outcomes. His pioneering work on knowledge transfer is now the nationally recognized gold standard used by companies ranging from Microsoft and Boeing to Nike and Zynga, as well as many organizations in the public sector. Trautman's tested approach combines humor, street smarts, and boardroom wisdom to give today's executives what they need to become practical leaders. He lives in Seattle, WA. Read more at www.HighImpactTalentManagement.com.